The platforms that run serverless workloads are just one aspect of a larger ecosystem of tools to manage and monitor applications throughout the software development life cycle. Although many solutions are open source, there is a strong influx of companies hoping to profit as enterprises move serverless application into production environments. This article uses survey data to show which tools are seeing adoption by those using serverless architectures. Frameworks make it easier to develop and deploy applications. The most popular framework in our survey was Serverless Framework by Serverless, Inc., which can be used on many different cloud platforms. Serverless, Inc. has found some success translating its early lead into the adoption of another of its offerings, Event Gateway, which routes events and assists with API development. We found that 7 percent of current Serverless Framework users already deploy Event Gateway, with another 20 percent planning to do so in the next 18 months. The second most commonly mentioned framework only helps with AWS-centric development, the Server Application Model, from Amazon Web Services. 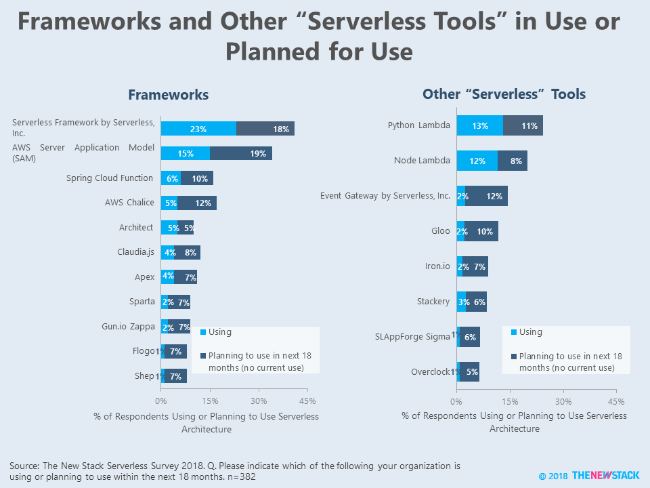 As we previously reported, 62 percent of everyone expecting to use a serverless architecture say they will be writing functions using Python. Thus, it is not surprising that Python-specific tools like Python Lambda and AWS Chalice made significant showings on serverless roadmaps. Red Hat’s acquisition by IBM has been the biggest story of the year, dwarfing Microsoft’s acquisition of GitHub. But the acquisition has been notable for many reasons, one of them is that this is the third largest IT acquisition in history, after Broadcom and Dell-EMC. The New Stack founder and Editor-in-Chief, Alex Williams, sat down with Lauren Cooney, founder and CEO, Spark Labs; Tyler Jewell, CEO, WSO2; and Chris Aniszczyk, CTO and COO, the Cloud Native Computing Foundation, to discuss the repercussions of this acquisition in this episode of The New Stack Analysts. It seems we are entering the age of consolidation in the space of container operations. Last week, IBM announced that it was buying Red Hat, at least in part to get to all that Kubernetes expertise on-hand at Red Hat. This week brought another acquisition, that of VMware purchasing Kubernetes consultancy Heptio. This one is certainly not as large as Big Blue buying the leader in open source enterprise software, but in many ways, it is just as significant. Heptio was created by Joe Beda and Craig McLuckie, who are two of the three principals behind the creation of Kubernetes at Google — the third being Brendan Burns, who is now at Microsoft. Mix in the partnership work that VMware has done with AWS, and all of a sudden, we can see the competitive race of who can best deliver a hybrid cloud Kubernetes experience to the enterprise, with the players being IBM/Red Hat, VMware/AWS, Microsoft, and, coming up from behind, Oracle. Bitnami has made its Stacksmith platform free in a public tier for users deploying applications that use assets from a public repository that are being deployed on public clouds. It also added Stacksmith Team to enable an organization’s teams to share projects, use assets from private or public repositories, and deploy on multiple public or private clouds. During a one-on-one interview with The New Stack, James Strachan, senior architect at CloudBees and the project lead on the new Jenkins X project, discusses how Jenkins X’s support of Kubernetes — and now serverless platforms — reflects how CloudBees is becoming more cloud native. From a consumer perspective it is best to depend on single functionalities, but from a producer’s perspective, this is an unmanageable approach. In this contributed post, Liferay Developer Advocate Milen Dyankov shows you the easiest way manage Java dependencies. 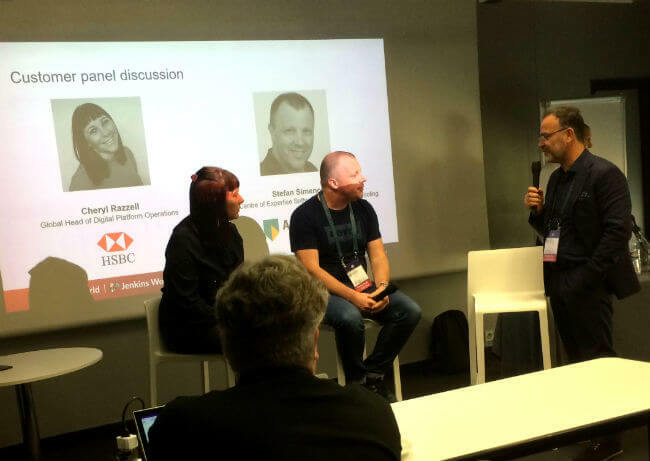 (From left to right) Cheryl Razzell, global head of digital platform operations, HSBC; Stefan Simenon, head of center of expertise software development and tooling, ABN AMRO Bank; and Diego Lo Giudice, an analyst for Forrester, during a Q&A session at DevOps World | Jenkins World 2018 in Europe. KubeCon + CloudNativeCon is coming to China. Multicloud architectures across distributed platforms have led to a rich community of open source projects. Come learn how these new platforms are serving as the foundation for at-scale application development, deployment and management. 20% off with code KCCNCN18MED20. Register now! The New Stack’s Guide to Serverless Technologies will help practitioners and business managers place these pros and cons into perspective by providing original research, context and insight around this quickly evolving technology.